The Dawn Spacecraft has been orbiting at Vesta for some time now. Surely some great science, but visually we are looking at an object that reminds us very much of the Martian moon Phobos. And like so many of the smaller rocky bodies of the inner solar system — up close, most images could easily pass for Apollo images of our own moon. However, there are some things we haven’t seen very much of on rocky surfaces like Vesta. Dark and light ejecta material reminds us more of what we see at Iapetus and Hyperion (both Saturnian moons) — which are largely moons of ice. The grooves which nearly reach all the way around Vesta are very similar to the grooves found on Phobos (a rocky Martian moon). Many scientists believe those lines came from the cataclysmic event that formed Stickney Crater which nearly shattered the small moon, but instead left behind rippled scars as gravity pulled it all back together. Similarly, an enormous crater at the Vesta's south seems to correspond to these multiple ridges. In contrast to nearly every other phase of the mission to and from Itokawa, the re-entry and landing on Earth went without a hitch. The capsule was retrieved and returned to Tokyo, where hopefully it will contain the first ever asteroid samples that did not go through the extreme heat of passing through the Earth atmosphere. 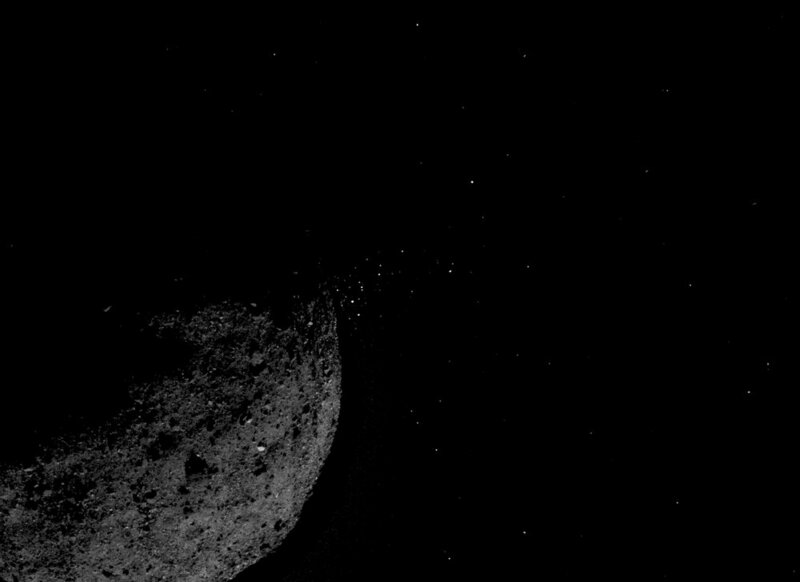 What NASA thinks we might be looking at here is an asteroid that was recently shattered by another asteroid, giving it a comet-like appearance. It stays within the asteroid belt, so it cannot be a comet as those objects are known to be dusty ice-balls that stay in highly elliptical orbits around the Sun. See the Hubble site for more. Asteroid Steins seen from a distance of around 800 km by Rosetta. This tiny asteroid is only around 5 km at it’s largest dimension with a crater on the top right that is approximately 1.5-km in size. That is a large impact for such a tiny body, but we have seen small bodies survive such large impacts before (Phobos, moon of Mars for instance). It seems like a pretty typical asteroid thus far and joins the growing family of such bodies visited by we humans. As a matter of fact, if I didn’t know where this came from — I would have assumed it was just another tiny moonlet imaged by Cassini in orbit around Saturn. See the flyby animation on the official ESA Rosetta site. For those keeping score… the next major encounter in our Solar System is in just about a month with another Messenger visit to Mercury. Steins, a rare E-type asteroid, is going to have company tomorrow as Rosetta swings by on its long voyage to Comet 67P/Churyumov-Gerasimenko scheduled to occur in 2014. See a quick computer simulation of tomorrow’s encounter here. The encounter is to take place on Sept 5 with data and images to be communicated back to Earth that evening. Processing of that information is to take place on the 6th along with a press conference. Chances are, images and other information will not become public until that conference is underway as ESA still likes to roll things out the old fashioned way. Cassini takes a pass at Titan on February 22 (already having made a pass this year on January 5th). Soon after Titan, Cassini performs a truly unexpected maneuver and flies directly through the plumes of Enceladus on March 12th. This is a somewhat risky task for the probe as the particles it will surely encounter may pose some kind of impact threat to the spacecraft. Mission planners expect the risk to be low as they intend to turn the spacecraft around and let the less delicate side of Cassini bear the brunt of the material and photograph the geysers as it moves away from Enceladus. It should make for some of the most exciting planetary science planned for this year. Cassini has another go at Titan on March 25. Yup – you guessed it. Cassini at Titan again on May 12th. The Phoenix lander arrives at Mars on May 25th and (hopefully) makes good on the failure of the Mars Polar Lander. It will be the first time a probe will attempt a landing on the Martian pole and will conduct a series of experiments looking for the existence of water ice. You can never have too much of a good thing. Cassini at Titan again on May 28th as well as July 31. Chandrayaan becomes India’s first planetary probe as it leaves for the moon in Early July (was April). The extended Cassini mission has made Enceladus a prime target of investigation and the new encounters begin on Aug 11th and comes within 54km of the surface. Rosetta still on its way for an encounter with Comet 67P/Churyumov-Gerasimenko in 2014, will make a close pass at an asteroid named 2867 Steins on Sept 5th at a distance of only 1700 km. Steins is a small asteroid measuring only a few kilometers in size and the craft will be traveling at a relatively slow speed which should allow for some good resolution images to be acquired during the encounter. Messenger (having just completed the first encounter in 33 years this past week) has another go at Mercury on Oct 6th and flies past more uncharted territory on its way to eventual orbit insertion in 2011. Two more close flybys of the Saturnian moon Enceladus on Oct 9 and Oct 31. The first at hair-raising distance of 25km and the second around a more reasonable 200km. In an effort to recognize the International Lunar Decade (and intended manned Lunar missions within 15 years), the United States returns to the moon with the Lunar Reconnaissance Orbiter on Nov 3rd. It is expected to begin its scientific goals only 3 days after launch and is expected to look for possible deposits of water ice in permanently shadowed craters near the Lunar poles. And finally more Titan flybys on Nov 3, Nov 19, Dec 5 and Dec 21. All this is in addition to the ongoing work of Opportunity and Spirit on the surface of Mars. Mars Express and Mars Reconnaissance in orbit around Mars. Cassini’s non-targeted continuing tour of other icy Saturnian moons. And who knows, maybe we will see more than 2 or 3 reports coming from the ever quiet Venus Express mission currently at Venus. Sadly, some very exciting missions will be quietly traveling en route to their targets and are not expected to be heard from in 08 like the Dawn Mission to the Asteroid Belt, New Horizons mission to Pluto/Charon, the newly re-targeted Deep Impact mission (now known as Epoxi) as well as Stardust now on its way to a follow-up visit to Tempel 1 the comet that was smacked by Deep Impact in 2005. The Dawn mission to the 2 largest asteroids in our Solar System was supposed to have been launched this week, but has been postponed until September of this same year. Apparently due to Dawn’s repeated launching schedule delays it could have interrupted the launching schedule for the Mars Pheonix lander which has a less flexible launch window. The above images are the best taken thus far of both objects by the Hubble Space Telescope (images not to scale). Vesta appears to be similar to most objects of its type with one exception... We most likely have samples of this body here on Earth as meteorites. It seems the composition of a bunch of meteors known as HED class meteors match that of observations made of Vesta. The theory is that at some point a huge impact took place on Vesta which shattered it into many fragments. Some of these Vesta originating fragments are orbiting the sun in the Asteroid belt to this day while smaller bits of this collision were thrown inward toward the sun (likely through disturbances coming from Jupiter) and some wound up landing here on Earth as meteors. If this turns out to be true, then Vesta would be one of only 5 bodies that we currently have confirmed samples of. Those additional bodies being our own moon, Mars (also through a similar natural meteoric process), Wild 2 and Earth itself. Ceres on the other hand is the largest Asteroid in the Solar System and for a few days was considered a planet in 2006 until the definition of “planet” was fine tuned a few days later to exclude not only Ceres, but famously Pluto as well. However, an upgrade was in order and Ceres is now officially a Dwarf Planet as it maintains its own spherical shape, orbits the Sun and is not itself a moon of any other body. More interesting than its definitive status in the Solar System is the fact that it is relatively warm, may have a tenuous atmosphere and frost on the surface. Some surface features have also raised many questions about the nature of Ceres such as the dark spot that was imaged in 95 and later disappeared. Then there is the recently observed white spot which has no theoretical identity at all. Hopefully, this may mean that in 2015 we may discover that Ceres is not just another heavily cratered inactive grey body in our Solar System but another enigmatic body like Io and Enceladus that defies preconceived notions of what to expect. Who knows what processes might cause Ceres to be active on any level, but surely we have been surprised before. 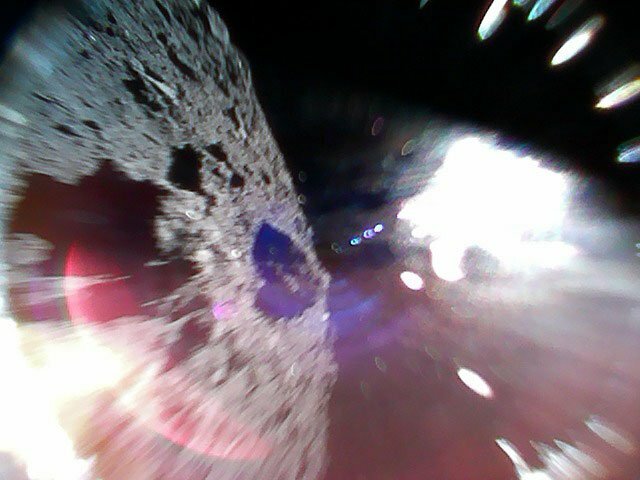 Itokawa (full name 25143 Itokawa) is an Earth crossing type asteroid that was visited by JAXA (Japan Aerospace Exploration Agency) in 2005. It was, and still may be, the first asteroid to be sampled and returned to Earth. To make a long story short, JAXA attempted quite a complicated mission for such a young agency and sent a probe to Itokawa. The plan was for Hayabusa to orbit, land upon, sample a bit of the surface and then return those samples back to Earth for retrieval. Currently, the mission is seriously damaged and operating on 1 of 3 reaction wheels. Additionally, Hayabusa suffered a major solar flare that damaged several battery cells, a rehearsal landing failed, the agency is unsure if any samples actually made it into the return cannister and 2 probes designed to study the surface also failed. Despite all this trouble and serious concern about its ability to even make it back to Earth… in early 2007 Hayabusa began its long questionable trip back home. Should it make it, the sample return cannister should re-enter Earth atmosphere in 2010. The main body Ida and the smaller asteroid, or moon, named Dactyl are a part of the family of asteroids found between the orbits of Mars and Jupiter. It is thought that all of these types of asteroids were created by some cataclysmic event which blew apart a larger body, perhaps around 200 to 300 km in diameter. This event (which is theoretical) would also have taken place long after the formation of the solar system and so in celestial terms it is considered a “recent” event. That means had this event not taken place we would have had at least one more dwarf planet in our solar system than we do today. This flyby was planned as an “extra” for the Galileo mission as they were for the most part “on the way” to its central mission to the Jupiter system. It is thought that Dactyl has a nearly identical composition to Ida and is therefore not thought to be a “captured” moon, but rather one formed somehow from itslef either from a later impact or from the destruction of the originating body.